UberMenu implements a single-menu responsive solution. At 767px (the standard breakpoint for mobile devices), the menu collapses into a menu toggle which can be clicked to reveal the menu items. 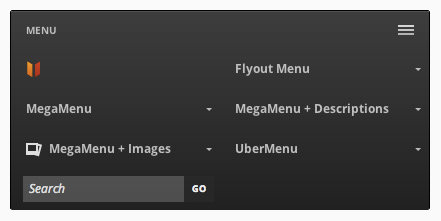 UberMenu remains full-size on larger devices like iPads. Read the articles below for information on the standard breakpoints, using UberMenu with Android & iOS, strategies for hiding menu items at different resolutions, and troubleshooting themes with existing responsive menus. Adds an off-canvas mobile menu on mobile devices, compatible with UberMenu. 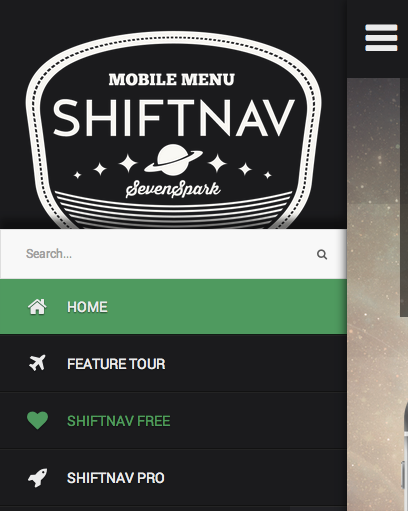 The Responsive Select Menu plugin offers a different paradigm for handling responsive menu functionality, by collapsing the menu to a selectbox on mobile devices. It is compatible with UberMenu.